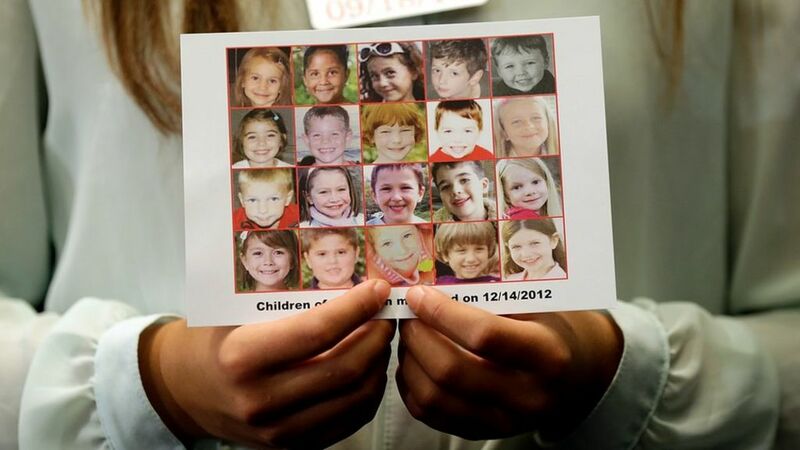 Almost five years on, the FBI has declassified 1,500 pages relating to the Sandy Hook school shootings in Newtown, Connecticut. Adam Lanza killed 20 elementary school children, six adults and his mother on 14 December 2012 before turning the gun on himself. While details of 20-year-old Lanza's declining mental health were already known, new details about the attack and his possible motive have been revealed within the still heavily censored documents. One intelligence report says evidence suggests "the shooter had an interest in children that could be categorised as paedophilia", but others question this view. Other new revelations include further details on Lanza's online behaviour and his intense obsession with mass shootings before he carried out one of the worst in US history. Lanza expressed an interest in Japanese techno music and had reportedly been taking some language and college courses. He held National Rifle Association safety qualifications after visiting shooting ranges with his mother, Nancy. A vegan who said he did not like the texture of food, he was only 111lb (50kg) when he died. He owned some video games that could be classified as "violent" but expressed a love of fantasy role-playing ones. In fact his apparent favourites included an interactive dancing game and Mario Kart. The FBI concluded there was "no evidence" he viewed his killings as a "video game" or a contest. Authorities uncovered multiple gaming devices and computers when searching the Lanza family home - including a hard drive that had been "significantly damaged by force trauma" and "scratched with an implement". In his online activity authorities uncovered his obsession with previous mass shootings and spree killings, including the 1999 Columbine High School shooting. Documents revealed Lanza had created a meticulous spreadsheet of previous mass murders. The files reveal one woman, whose identity was redacted, had an "online relationship" with him for more than two years after meeting him through a website where players adopt the roles of the Columbine shooters, Eric Harris and Dylan Klebold. She never knew Lanza's name or true identity, only speaking under usernames, but described him as "the weirdest person online" who spent almost all of his time researching and discussing mass murders. The woman said it was clear he was "depressed" and had a cynical and negative view of the world. She told authorities he had expressed some suicidal thoughts, but did not think he was capable of actually killing himself or others. The FBI however concluded that he had done "careful, methodical planning and preparation" for the massacre, and could have been considering it since March 2011. "The shooter was fascinated with past shootings and researched them thoroughly. The shooter shared many similar characteristics and behaviours with other active shooters," one report concluded. The FBI reports and interviews paint a picture of an increasingly isolated individual in the run-up to the shooting. He had been removed from school in his mid-teens by his mother after being "not excessively" bullied for his social awkwardness and low weight. Lanza had been diagnosed with Asperger's syndrome, and interviews suggest how much he struggled with accepting and medicating his condition. He was "unable to maintain any relationships", even with people with similar interests with him at his old school's computer technology club. All five weapons and the ammunition recovered by police after the shooting were obtained legally by his mother, who was described by one person they interviewed as a "gun nut". Some people blamed her for not intervening to improve her son's mental health and for having weapons in the house. Although a victim herself, she was not referred to in a memorial address by President Barack Obama. Reports about how close they were before the shootings were conflicting. But a medical professional said she was not allowed in his bedroom. The reports suggest Lanza sometimes may have slept on the floor instead of in a bed, and demonstrated other "strange behaviours". He reportedly liked to go on walks, including by the school, but also expressed an aversion to bright and natural light. Many neighbours interviewed knew little to nothing about the family, and some said they had not seen Adam for years. The woman he spoke to regularly said Lanza had expressed some details about his sexuality, including a notion that he may have been asexual. She told investigators he wrote "at least one lengthy email" to her expressing his views on paedophilia. In that he expressed his hatred towards it, but she said he had also described adult and child sexual relationships as "possibly beneficial to both parties". FBI behavioural analysis concluded there was "evidence to suggest the shooter had an interest in children that could be categorised as paedophilia". But they found no evidence that he had acted on any potential sexual feelings toward children. The online friend said he described feeling "pity" for children because he believed people in authority were "improperly controlling" them. She said that she suspected Lanza probably thought he was "saving" or "protecting" the children that he killed by "taking them away from harmful influences" including parents and teachers. Lanza had reportedly expressed his belief that death was "an escape from the pressures of life".